Israeli tanks, bulldozers and personnel carriers knocked down a border fence and entered southern Lebanon on Saturday. The equipment, carrying about 25 soldiers, raced past a U.N. outpost and headed into a village where other Israeli soldiers already had control. Artillery based inside Israel was firing into the area. In all, up to 2,000 Israeli troops entered the area Saturday, but some returned to Israel during the day. No Israeli or Hezbollah casualties were immediately reported. Earlier Saturday, hundreds of Israeli troops moved in and out of Lebanon, taking control of a village and engaging Hezbollah militants by land, sea and air as part of the country's limited ground campaign. The soldiers, backed by artillery and tank fire, moved into the large village of Maroun al-Ras on the Lebanese side of the border early Saturday and took control, military officials said on condition of anonymity. Lebanese security sources, who also spoke on condition of anonymity because of the sensitivity of the information, disputed the account though, and said that the Israeli military had made incursions of only a few hundred yards into the Maroun al-Ras and Yaroun villages. But an AP reporter on the Israeli side of the border saw Israeli troops head into Maroun al-Ras and said they were still fighting with some Hezbollah militants. At one point in the fighting, a half-ton bomb was dropped on a Hezbollah outpost, about 1,640 feet from the border and near the village. More positions were bombarded by Israeli gunboats operating off the coast. Soldiers told The AP that IDF forces were just 600 feet from Hezbollah militants who fired back. There were no injuries or deaths reported. Also, The New York Times reports that the Bush is sending precision-guided bombs to Israel, which requested an expedited shipment last week at the outset of its offensive against Hezbollah targets in Lebanon, U.S. officials said Friday. The bombs are said to be part of an arms package that Israel can tap into whenever it needs. Israeli officials won't comment on the shipment apart from saying the army has been using precision-guided weapons to minimize harm to civilians, reports CBS News correspondent Charlie D'Agata from Jerusalem. On Friday, Israel knocked out a key bridge on the road to Syria and pummeled Hezbollah positions in the south as long lines of tanks and armored personnel carriers lined up at the border, in some places close enough to see Lebanese homes on the other side. U.S. Secretary of State Condoleezza Rice will visit the Middle East on Sunday, her first trip to the region since the crisis erupted 11 days ago, even as she ruled out a quick cease-fire as a "false promise." CBS News chief White House correspondent Jim Axelrod reports that the fact that Rice is not coming to Israel until Sunday is an implied green light to Israel to keep hammering at Hezbollah for at least two more days. In Beirut, ships continued to arrive at the main port, part of a massive evacuation effort to pull out Americans and other foreigners. France, the United Nations and Red Cross demanded Israel open humanitarian corridors to allow life's necessities—shelter, food, water and medicine—to reach the swelling numbers of displaced people, an estimated half-million. Responding to a U.S. request, Israeli Defense Minister Amir Peretz said French aid would be allowed into Lebanon's port of Sidon. The Lebanese health ministry reported 362 deaths in Lebanon so far in the onslaught, an increase of 55 since it release figures on Thursday. Thirty-four Israelis also have been killed, including 18 soldiers and an air force officer killed Friday in the collision of two helicopters. Hezbollah has fired hundreds of rockets at northern Israeli towns from north of the Lebanese border, killing 16 civilians and forcing hundreds of thousands of Israelis to repeatedly flee into bunkers. On Saturday, at least 42 rockets struck Karmiel, injuring two people, while rockets also fell on Kiriyat Shemona, Nahariya and smaller communities such as Bet Hilel, Mayan Baruch and Mashov Am. Air raid sirens sounded several times in Haifa, Israel's third-largest city, but no rocket strikes were reported. After Maroun al-Ras was taken, several small groups of Israeli soldiers in armored personal carriers traveled to and from the village, but there was no large scale movement of troops into Lebanon. In Marwahin, also along the border, Israeli troops recovered anti-tank missiles, a launcher, and other weapons used by Hezbollah. The army said that more than 150 Hezbollah targets in Lebanon had been attacked. An official from the U.N. monitoring force in south Lebanon said Friday that between 300 and 500 troops are believed to be in the western sector of the border, backed by as many as 30 tanks, but so far Israel has ruled out an immediate ground incursion to sweep Hezbollah out of the area. Israel's army chief of staff, Lt. Gen. Dan Halutz, on Friday said the military would conduct "limited ground operations as much as needed in order to harm the terror that harms us," leaving it unclear how deep and how powerful the Israeli punch into Lebanon would be. Instead, Israel wants to weaken Hezbollah to make it easier for the Lebanese army to move into areas previously controlled by the guerrillas, possibly with the aid of a beefed up international peacekeeping force, the official said. 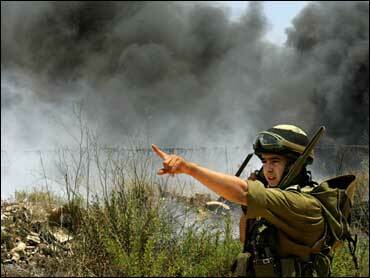 An Israeli ground incursion, however, could dramatically increase the pain in Lebanon. More than 400,000 people live south of the Litani River, north of which Israel wants to push Hezbollah. Though tens of thousands have left, many are believed still there, trapped because roads were damaged by Israeli bombs or afraid of being caught in the airstrikes on thoroughfares.